On New Year's Day 1945, eight German divisions attacked south out of the Saar attempting to trap Eisenhower's thinned-out flank in Alsace. In the Ardennes, the Battle of the Bulge was at its height. During the next few days the fighting around Bastogne was as bitter as any since D-day. On the other hand, as for getting to his strategic objective, Antwerp, or anywhere near it, Hitler no longer had a chance. His chief of the Army General Staff, Generaloberst Heinz Guderian, had told him as much at Christmas and had also told him that the Russians along the Vistula were ready to unloose their most powerful offensive of the war. Calling the report on the Russians a colossal bluff, however, Hitler ref used for a week to concede that the breakthrough to Antwerp could not be made. He then waited five more days before taking his spearhead force, Sixth Panzer Army, out of the front in the Ardennes, and took another week making up his mind to dismantle the rest of the buildup in the Bulge. When Hitler returned to Berlin from his Western Front headquarters on 15 January, the Vistula line in Poland was collapsing. Two weeks later the Russians were on the Oder River at Kuestrin, thirty-five miles from Berlin. On the 26th, Marshal Georgi K. Zhukov reportedly told Stalin he could be ready to attack toward Berlin in four days.1 In the west, the U.S. armies were barely back to the line in the Ardennes that they had held in December, and in Alsace the Germans were still fighting hard. Who would arrive in Berlin first seemed not to be a question anymore. At the speed they had moved in January, the Russians could have been first on the Rhine. The economy was prostrate. In Stolberg no stores were open. The municipal labor office in Aachen had registered all able-bodied inhabitants for work at clearing rubble and repairing roads. The work was unpaid, and for one job on which 200 workers were called, seventeen appeared, a typical turnout. For all jobs the only workers to be found were boys under sixteen or old men. Military government was under orders not to concern itself with reviving the German economy, but it had an interest in coal, which in winter ranked next to food as a necessity of life. The Aachen mines had formerly employed 20,000 men. In February 1945 there were 1,000 working in the mines; and they had a 33-percent rate of absenteeism, because the ration was not enough to sustain a man at heavy work in the mines, and miners could not buy anything with their pay. The workers easiest to secure and most reliable were those employed by the Army. 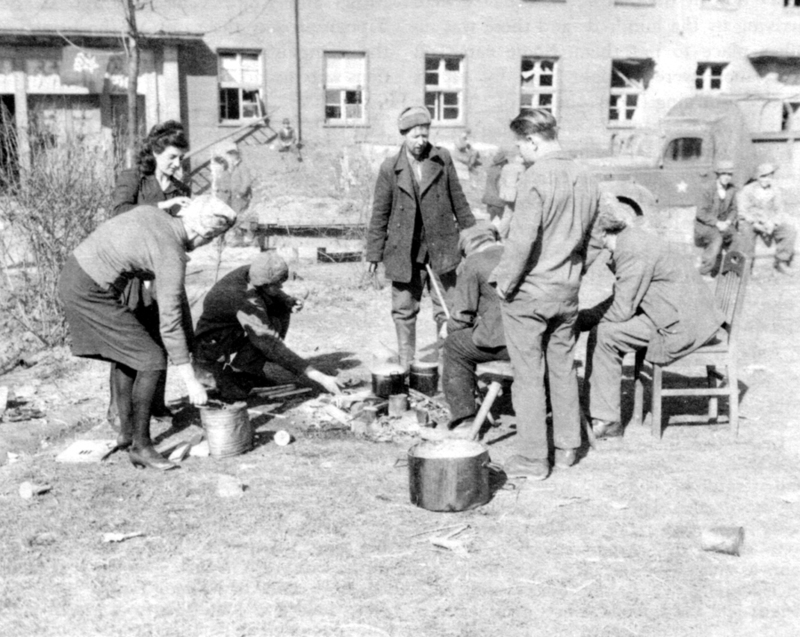 Army employees received a noon meal-something which was going to prove a major attraction for many Germans in the coming months and years. The meal was prepared and served on the job partly for the sake of economy but also because if the worker was allowed to take the food home, it usually went to his family. The civilians' feeling of relief at being out of the war was beginning to give way under the hardships of the winter to a subdued resentment. 4 But the resentment was not at a level approaching resistance to the occupation. Of 487 cases tried in Ninth Army military government courts up to the end of January, three-quarters were for minor circulation and curfew violations. In the two most serious cases, one defendant got twenty years for spreading rumors prejudicial to Allied interests and the other got fifteen years and a 10,000 Reichsmark fine for disobedience to military government orders. The other cases were sometimes interesting but hardly evidence of a threat to military security. 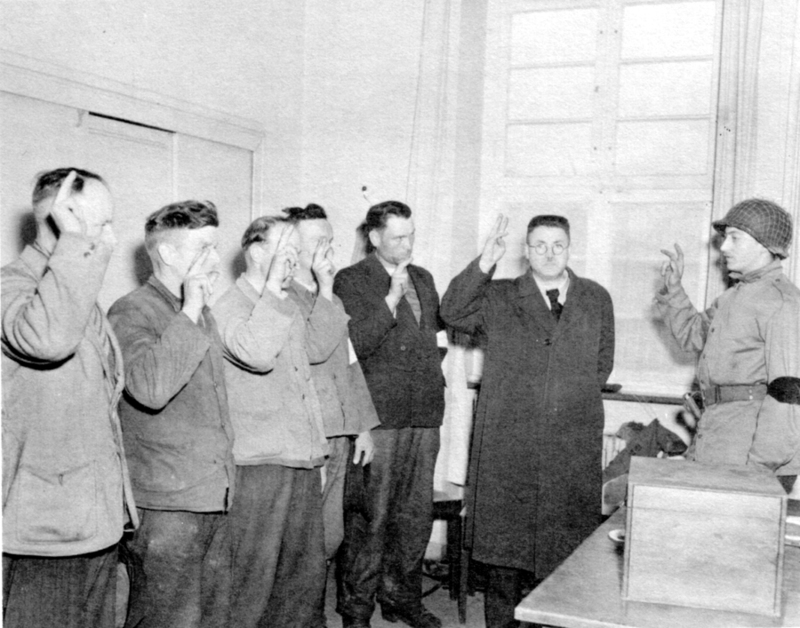 Even harboring German soldiers, a serious crime, usually turned out not to have been motivated by malice. In one instance a mother wanted to keep her son at home ; in another a homeowner needed someone to fix his house and the soldier was handy with tools ; and in a third a soldier turned himself in after a lovers' quarrel with the woman with whom he was living. 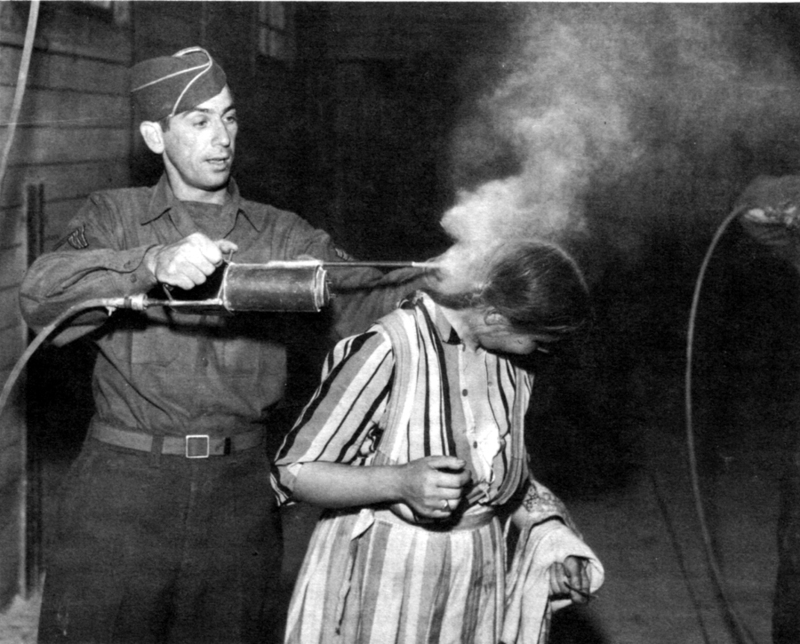 He went to a prisoner of war camp, she to jail for fifteen months. In Schaffenberg, outside Aachen, a man was sentenced for holding a public meeting. He had hired a carpenter to repair his house and a crowd had gathered to watch the carpenter work. In Brand a summary military government court fined a civilian 100 marks for calling the Buergermeister a thief and a Nazi. The review board reversed the sentence on the ground that civilians should be encouraged to comment on public officials. 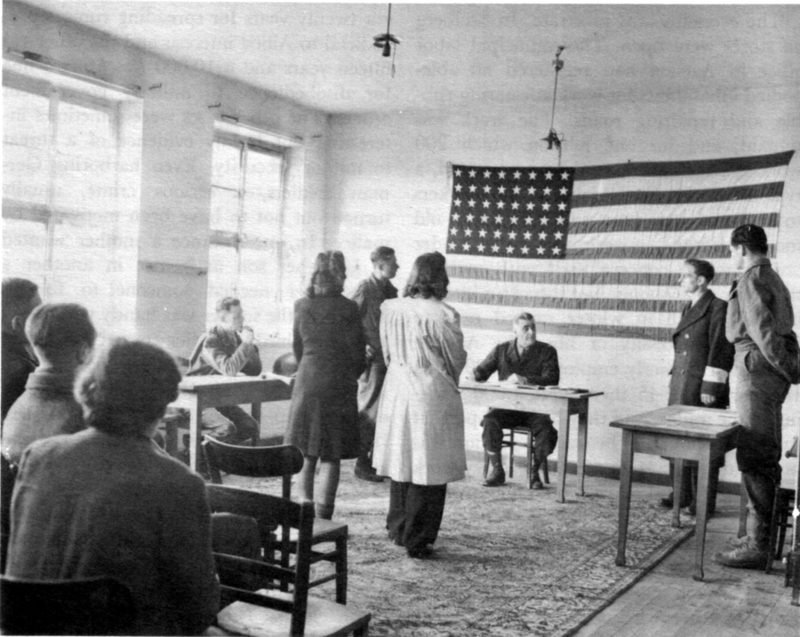 TRIAL IN A MILITARY GOVERNMENT COURT. The two German women were convicted of illegal border crossing. Although disenchantment with Oppenhoff's administration set in early, the sometimes peculiar circumstances of the time gave him a surprisingly solid hold on his office. Competent non-Nazis were among the rarest commodities everywhere in Germany, not only in Aachen ; in the managerial and professional groups they were practically nonexistent. In Strassburg, 6th Army Group captured the personnel files of the Deutsche Aerztebund (medical association) of Land Baden. Of its membership, which comprised all of the doctors and dentists and many of the public health officials in Baden, less than a quarter had no or only slight party connections.11 The medical profession had one of the highest percentages of Nazis, but law, teaching, and public administration were not far behind. Bona fide political opponents of the regime, if they had survived at all, were generally old men, like Hollands. Oppenhoff and his colleagues were competent, perhaps irreplaceable, and consequently appeared indispensable, to the Americans more than to the Germans. To their fellow Aacheners they represented a new elite, not of money (Oppenhoff's salary was 450 marks a month) or real power (the Americans held the power) but of survival. They had eluded the Nazis painlessly and somewhat profitably and they seemed to be handling the consequences of defeat in the same way. They were not living elegantly but they fared a great deal better than the average cellar or bunker dweller. To the occupation forces, they represented stability. The tactical commands in Aachen changed from week to week and, in crises such as the Bulge, sometimes from day to day. Within six weeks in December and January, the over-all command shifted from First Army to Ninth Army and then back again; the military government detachment had three commanders before the end of December. By the time Oppenhoff had been in office three months, he knew more about running Aachen under the occupation than any of the Americans. was still obscure and the method of achieving it in doubt. To destroy the Nazi regime was an often stated United Nations war aim dating back to the Atlantic Charter; but did this policy mean the elimination of every party member, even at the price of inconvenience to the occupation forces? Military government had assumed that as long as hostilities continued, its first responsibility was to the combat commands, which would benefit most from an orderly and efficient civil administration. Was denazification to be pushed to the point where it might impair military government's effectiveness and so affect the interests of the troops? Men like Oppenhoff and his colleagues raised a still more difficult question : Was it the business of the occupation to bring democracy to Germany? The Americans considered themselves individually and collectively as natural apostles of democracy. The occupation plans were devised to demonstrate, in the court system for instance, the differences between totalitarian and democratic methods. Neither the policy nor the plans, however, provided for an active democratization program. On the other hand, democratization was so compellingly logical an objective, so much what the war ultimately was all about, that it was bound to become the standard against which the occupation was measured. The Psychological Warfare Division, SHAEF, did not have the same priorities and responsibilities as military government. Its job was to create an image of the occupation in the German mind, and to do so PWD wanted to get on with the business of democratization. For this purpose, the Oppenhoff administration was not ideal raw material. In January, three captains from Psychological Warfare, Saul K. Padover, Paul Sweet, and Lewis F. Gittler, investigated the Aachen city government and were dismayed. Their report charged military government with having allowed a new elite to emerge-one "made up of technicians, lawyers, engineers, businessmen, manufacturers, and churchmen," and one which was perhaps not Nazi but certainly did not fit the American picture of democracy.12 The report, according to Padover, reverberated throughout the European Theater of Operations.13 The three captains from PWD had signaled the arrival of a powerful ally for radical denazification, the traditional American democratic idealism. Oppenhoff died as many Germans did that spring, unmourned and without many questions asked. The Americans found it hard to see Oppenhoff as an anti-Nazi martyr, and one favorite theory was that his disgruntled and recently discharged colleagues, of whom Faust was one, had committed the murder.19 Six months later, after the war was over and Oppenhoff nearly forgotten, intelligence investigators uncovered the true story. The order for the murder had come from Himmler and been carried out by border police to set an example for the Werfwolf, the allegedly spontaneous, Nazi-sponsored, German guerrilla and underground resistance organization.20 The staged killing, ordered in January and planned by an SS general as if it were a major operation, was probably the Werwolf's most sensational achievement. Shrivenham. The front had not advanced any farther into Germany after November. Meanwhile, the pinpoint assignments had changed so often to keep pace with shifts in plans that it was hard to believe anyone was going anywhere. The latest strategy gave the priority to Montgomery's army group which included only the US Ninth Army. Third and Seventh Armies apparently might be parked on the German border indefinitely, and First Army's prospects were not much brighter. In the third week of February, Ninth Army, the one with the most substantial mission, was standing on the bank of the Roer River waiting for the water to go down. The Germans had opened the dams upstream and flooded the valley down to the Meuse. First Army had taken the dams, but the Germans had done their work well and blown the gates in time to get maximum effect from the millions of tons of water pouring into the valley. Nevertheless, the dams were no longer a threat. The flood crested, and when it began to recede, the war changed. In the early morning darkness, behind a 2000-gun barrage, Ninth Army crossed the Roer on 23 February. Nine days later the army had a spearhead on the Rhine opposite Duesseldorf. First Army joined in on the south and at the end of the first week in March got what Ninth Army had wanted and not found, a bridge on the Rhine, at Remagen. Against crumbling German resistance, Third and Seventh Armies then cleared the southern Rhineland during the first three weeks of March. Ninth Army, advancing from Aachen northeastward toward the Rhine, had the first look at the Germany of 1945, and it was a dismal sight. Detachment I3G2 entered Juelich on the third day. Lying on the right bank of the Roer, the city had been bombed from the air and blasted by artillery. The people were gone. 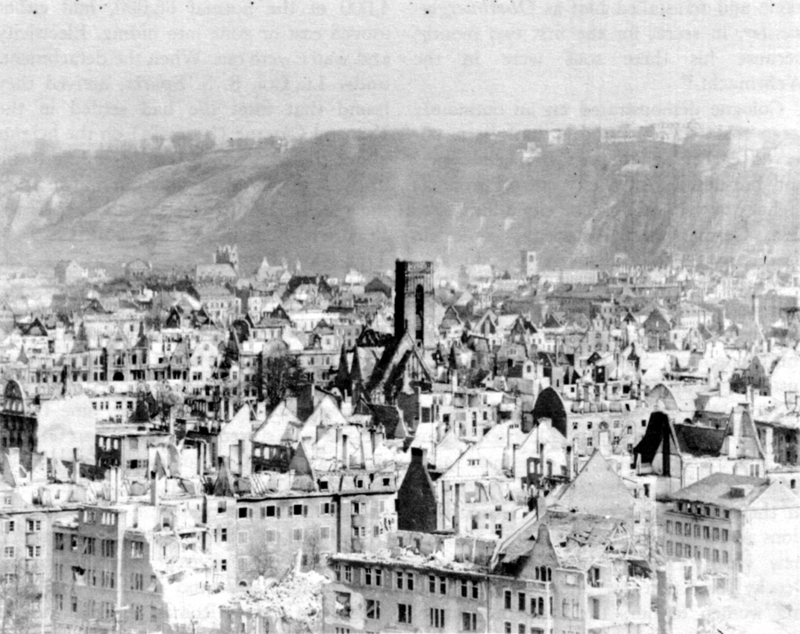 The physical destruction was put at 100 percent, probably a wartime record for cities in Germany. What the bombs had spared, the shells had churned into complete uselessness. With nothing to govern, the detachment turned to directing traffic. The other communities less than ten miles beyond the Roer were in a similar, if not quite as bad, condition. lapsed, the furniture could be seen in place in rooms on upper floors.22 The walls left standing were covered with slogans: Dein Gruss-Heil Hitler! (Your Greeting-Heil Hitler !) ; Tapfer und Treu! (Brave and Loyal) ; Die Front fuer die Heimat! Die Heimat fuer die Front! (The front for the Homeland ! The Homeland for the front !) ; Erst jetzt Recht! (Now more than ever !) . Here and there, grim-faced older civilians could be seen painting out the slogans with whitewash. mations and ordinances, issue circulation and curfew orders, and remove the most obvious Nazis. They sometimes appointed an acting Buergermeister who would then frequently have to be left to struggle with the new rules on his own until the next unit came along and, as often as not, dismissed him for incompetence. In the big cities the pinpoint detachments moved in immediately, sometimes before the fighting ended. First Army began clearing Cologne, the largest city in the Rhineland, on 6 March, and Detachment E1H2 arrived on the 9th. 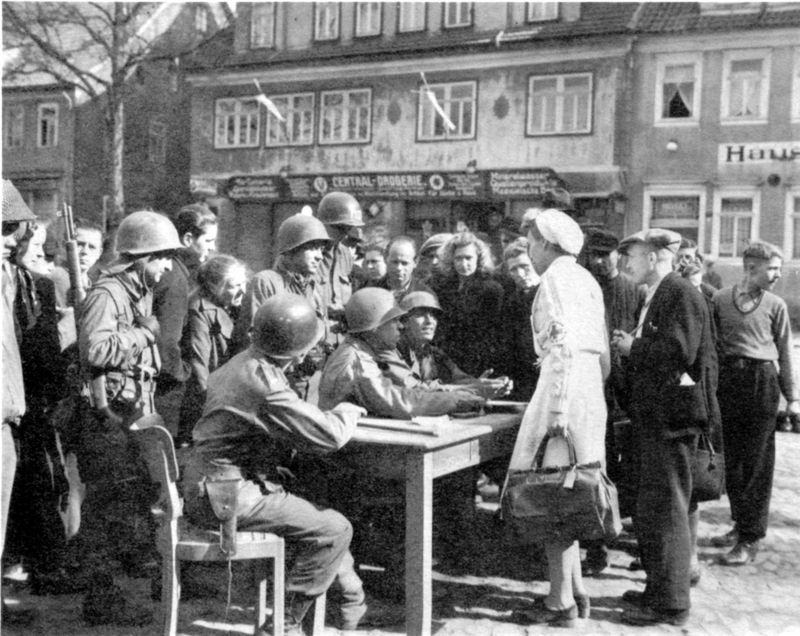 At the last minute before the Americans came, the Nazi Gauleitung had sent criers through the streets directing the women and children and men over sixty to cross over to the east side of the Rhine ; but, except for party big shots who left wearing Wehrmacht greatcoats over their party uniforms, few followed the directions because they would have had to go on foot with only the possessions they could carry in their hands. Some, women and children in particular, had left earlier either to escape the bombing or avoid the occupation. First estimates put the number who stayed at 100,000 to 150,000, but for weeks there was no way of telling how many were living in cellars or hiding in the outskirts. The most significant change in comparison with communities occupied earlier was a great increase in Wehrmacht deserters, Volkssturm men, and policemen who had stayed behind in civilian clothes. According to a strong rumor, a hundred Gestapo agents, called "die raechende Schar" (the avenging band) , had also stayed, to kill anyone who collaborated. If the rumor was true, the agents must have put caution before vengeance, because they were never heard from. Finding the city a wreck and over 70 percent destroyed was no longer a surprise, but the cellar life that had sprung up under the constant threat of air raids continued to astonish the Americans. The average citizen seemed to find spending his life underground entirely normal. A typical cellar contained bedding, a stove, a cabinet, and some decorations to give the place a homey touch. In the cellars, the inhabitants had even developed a brisk trade and social life. Many were hesitant about coming up into the daylight and facing the new risks of the occupation, but most were out in a few days scavenging among the ruins. The military government officers observed, as they had elsewhere, that the first reaction seemed to be to regard all unguarded property as free for the taking. For E1H2 and its commander, Lt. Col. IN THE WAKE OF BATTLE a German woman surveys the wreckage of her property. Cologne demonstrated on an ominously large scale something that had been observed earlier at Aachen : the helplessness and hopelessness of a city cut off from its lifelines to the outside. The city administration, German and American, could do practically nothing about getting the railroads, the power grid, or the food distribution system functioning again. Fortunately, the breakdowns in these services antedated the occupation, and the civilians had adjusted to them. The cellars contained stocks of food and coal, and the city had seventy-five wood-burning trucks. Electricity came in sporadically over the German grid. 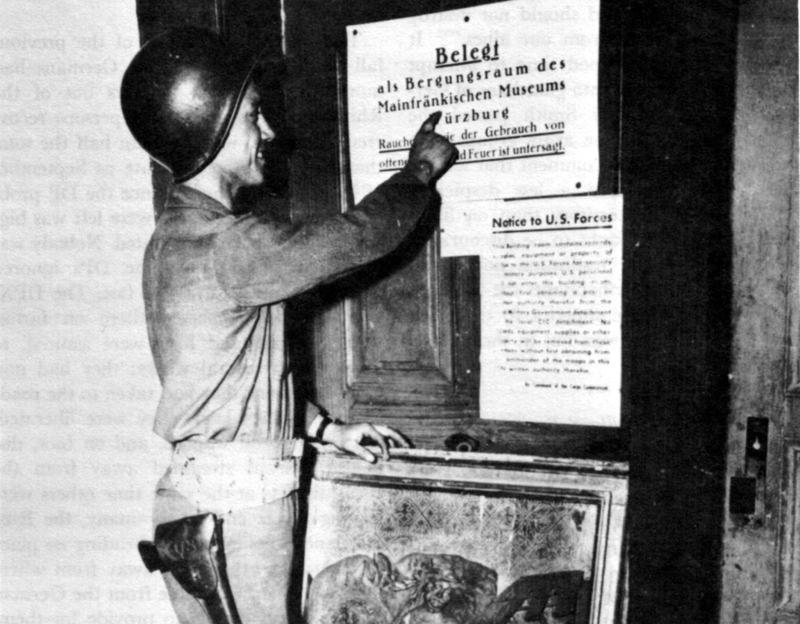 When it was on, the civilians could tune in their radios and hear the German stations across the Rhine broadcasting that the new chief of police in Cologne was a "cocky Jew," that the Americans were forcing women to bury the dead dug out of the rubble, and that hundreds of Negroes were standing guard over German civilians and forcing them to clean up the streets.30 The detachment believed that the population benefited by being able at last to compare the Nazi propaganda with reality. 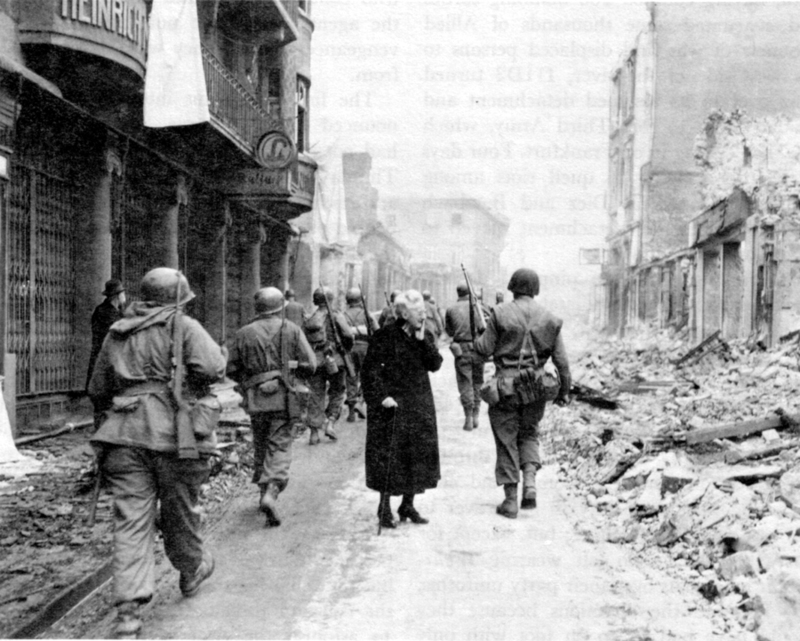 COBLENZ, MARCH 1945. In the background the forts at Ehrenbreitstein. Shorthanded or not, military government was propelled onto center stage in March 1945. The war would not wait. Training and practice were over and the real occupation was on. The nation that had almost conquered Europe was being brought as low as any of its victims had been. Germany's long-range future, if it had one, was undecided; the immediate future was in the hands of the G-5's and military government detachments, and even they were unsure of what it was to be. For the moment, what they saw most clearly were the approaching shadows of two relentless companions of war, disease and hunger. showed sufficient livestock to provide half the minimum monthly meat tonnage; enough chickens to supply one egg per person per month, "provided 300,000 people do not like eggs" ; enough milk to give each child under ten a pint a week; and enough butter to provide each consumer with a half pound a month. The statistics, however, were less chilling than what the detachments had reported during their march to the Rhine. In the countryside, fields were unplowed and practically no one was at work on the farms. The young men were gone ; the registrations showed that 90 percent of the males were over fifty years old. The foreign workers and prisoners of war who had made up the bulk of the agricultural labor force quit and took to the roads as soon as the front passed. There were too few horses. They, like the men, had been drafted into the Wehrmacht. Finally, thousands of acres of land were mined and too dangerous to work. In January 1945, the twenty-nine Poles in the camp at Brand were the only displaced persons held by SHAEF in Germany. On 31 March, the army groups reported 145,000 on hand in centers and 45,000 shipped out to France, Belgium, the Netherlands, and Luxembourg, the latter mostly repatriated citizens of these countries but also including eastern Europeans. Many thousands more had not reported to the centers or had not yet been evacuated from the division areas. The number of DPs on hand had doubled in the last week of the month and, wherever the Rhine was crossed, multiplied with every mile that the front moved east. By the time the Remagen bridgehead attained an area of fifteen square miles, it contained 3,500 DPs, 235 for every square mile taken. sibility of the occupation forces. Unanticipated too was the amount of care and supervision they needed. Homeless, without jobs, knowing neither English nor German, elated at being free but uncertain about the future, sometimes restless, sometimes apathetic, they caused problems in more than just feeding, housing, and road-clearing, as the DPX sadly discovered. SHAEF had proposed to turn the DPs over to UNRRA teams, but in March only seven teams appeared. The H and I detachments did the work; they were sometimes reorganized with a doctor, US or French welfare workers, and Allied liaison officers attached, and often operated without assistance and as a sideline to their military government assignments. In Aachen there were thousands of Russian DPs . . . . They lived in a huge caserne, and it must be said they were filthy in the highest degree. They ruined the light wires every time they were installed; telephones were ripped out; windows were broken as soon as they were installed ; fires broke out "accidentally" ; a liaison officer was murdered ; and the camp was in a constant state of chaos. The tactical troops assumed "responsibility" for the camp. They issued passes every afternoon for a group of DPs to visit the town. The visits were looting expeditions. The DPs would leave the camp with empty baskets and briefcases and return at nightfall loaded down like camels with all manner of goods. High on a hill overlooking the blighted city of Trier, the camp consists of a number of bleak greystone barracks disposed around a parade ground. At a distance the buildings still seem to retain some of their former military primness and neatness. However, on closer inspection they present a spectacle of confusion and human degradation which is difficult to describe. Literally thousands of former German slaves of all nationalities are constantly arriving or departing. The camp is administered only by three officers and six enlisted men, aided by two female members of the French Army. Appalling. As soon as I arrived I became unpleasantly aware of the stench of human excrement. I myself witnessed occupants of the camp who in plain view were defecating in the shrubbery in their barracks. No facilities for bathing or washing existed except for water hauled in containers from nearby tanks and pumps. The interiors of the buildings, except one-where French PWs are housed-are indescribably filthy and disorderly; all sorts of litter from broken bottles to articles of clothing lie strewn about on the floor. The occupants live in extremely crowded and unsanitary conditions and there exists a grave danger of disease of epidemic proportions-a danger not only for them, but also for American troops in the city where the occupants are allowed to circulate. The occupants for the most part have no change of clothing and pitiably few other belongings. I assume from the fact that many of them continually scratched themselves that the existence of body lice is widespread. camp is only a very temporary makeshift stopping place, with which none of the occupants identifies himself, each hoping to be off on his way home in a day or so. Even so, the sanitary conditions are such that they could only be tolerated by people who have lost their sensitivity for the niceties of civilization and have had their powers of self-reliance undermined. The dawn of the bright new world was clearly not going to be serene. In the third week of the campaign SHAEF G-5 Forward canvassed 12th Army Group and its armies and concluded, "The strictly tactical theory of military government has broken down of its own weight under pressure of practical considerations . . . ." The armies, the intended chief beneficiaries of the tactical system, conceded that an area as large as the Rhineland could not be administered for long within arbitrary unit boundaries, which sometimes divided cities in two, as the First Army-Ninth Army boundary did at Aachen. The detachments were being showered with regulations by tactical commands above them and could find themselves simultaneously taking orders from platoon commanders and army headquarters or any staff in between. One I detachment was under two corps and three divisions within five days. However, some functions, mainly agriculture and food distribution, were too broad for the armies to control. The 12th Army Group was having to take a hand in co-ordinating the armies' operations, and SHAEF G-5 expected the early result to be a compromise between the tactical and territorial systems, probably to lie achieved by installing the regional E detachments.62 At the end of the month, however, after the front had moved across the Rhine, the compromise was achieved without abandoning the principle of tactical control. 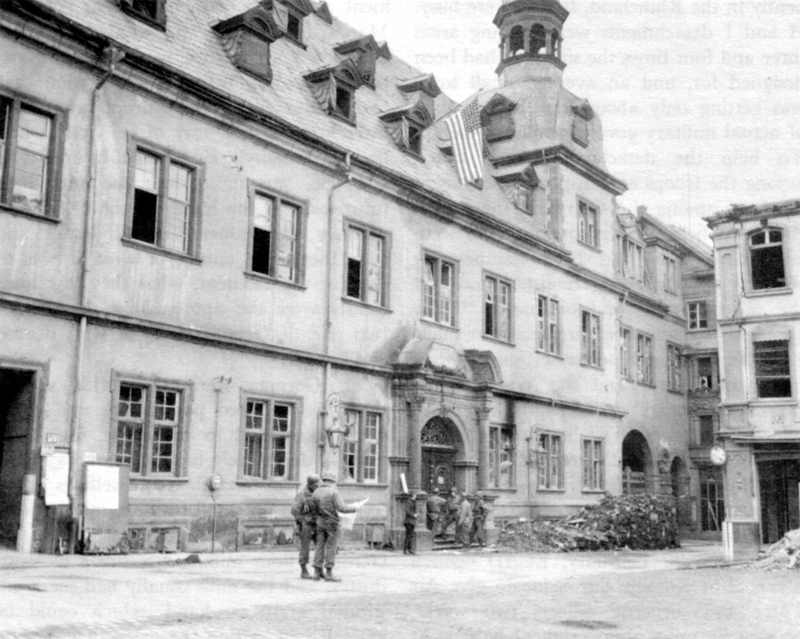 Headquarters, Fifteenth Army, which SHAEF had been using for odd jobs, moved in to set up a blocking line on the river and assumed territorial G-5 responsibility for the Rhineland.